The Operations Committee of the MTC will be meeting today at 9:30AM to discuss about what else to spend money on. The minutes from last month's meeting (PDF document) shows the committee asked questions about the $2 monthly fee charged to those who uses third-party benefit programs and gets their passes/e-cash directly loaded to their Clipper cards. The MTC rep at the microphone said the fee is similar to what others around the nation gets charged. The fee will last for two years and will be re-reviewed after the two years is up. At today's meeting, Clipper will be discussed in agenda item #4 (PDF document). Muni's senior pass has fully transitioned to Clipper only. Clipper cards used on BART accounts for 32% of all BART fare transactions. 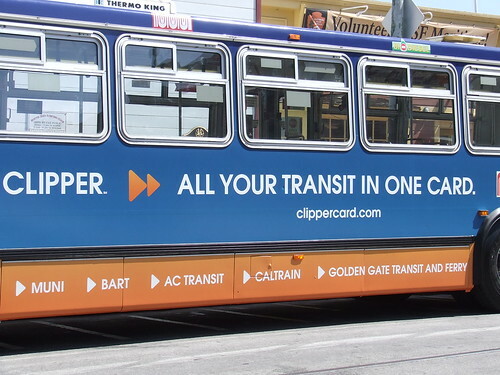 Advertising about the Clipper card at stations is given credit for the nearly 1/3rd of all ridership. People did not take the $2 monthly fee for direct loading of passes very lightly. When compared to the past (when the fee was not charged) and today (the fee charged), only 61% said okay to paying the fee; 39% said no thanks to the fee and found alternate ways to get around it. Cubic is asking the MTC to shift 50% of their customer service work to a Cubic call center in Tennessee. Since the customer service phone center is in Concord, in case if there's a major power outage or problem, the Tennessee office can take the brunt. Booz Allen Hamilton, a consulting firm for Clipper has a new parent company. It doesn't affect the MTC or Clipper that much. A total of $1,241,000 in contracts to three companies that handles customer education and promotion of the Clipper program, and one company that conducts inspection of equipment and budgeting. $250,000 will be invested to open a third Clipper customer service center. This new customer service center will be located in Oakland and will be contracted to the AC Transit ticketing office. The new service center will include advertising and improved equipment to allow such services as replacing a defective card. It's amazing to believe 32% of all BART transactions happens with a Clipper card. When you don't have to worry about demagnetizing tickets and not forgetting to take a paper transfer before leaving the station, that's a big plus. I'm still not pleased with the $2 fee for adding passes and other fare media directly to Clipper cards. A process that's so easy shouldn't come with a cost; but the alternate options with no fee can be a hassle: debit cards and vouchers costs money to produce and mail, and takes time out of peoples' day to obtain their next fare media. Clipper, MTC, and the commuter benefit agencies shouldn't wait two years, talk NOW. If 39% of people backed out, that's a serious sign the idea is FAILING. Hard facts to swallow: The MTC says that in February 2011 "about 20,000 Clipper customers were taking advantage of the automated add value services through third party transit benefit programs..." Since 39% of people rejected the $2 hike, this computes to 7,800 people saying "up yours" to paying the fee. If Cubic wants to shift 50% of the customer service phone calls to another state, doesn't that just mean layoffs here in the Bay Area? It's good there will be a third in-person customer service center, and it will be the first for the East Bay. In all honesty, there should be Clipper customer service centers at all transit agency main offices or major transit hubs so it covers each county. Lastly, why not join ("Like") the new Akit's Complaint Department fan page on Facebook? Click here and join in the fun!